OscarWildesLibrary is a Legacy Library. Legacy libraries are the personal libraries of famous readers, entered by LibraryThing members from the Legacy Libraries group. » Oscar Wilde's legacy profile. OscarWildesLibrary is also an author. 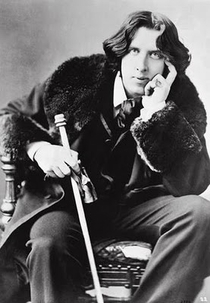 » See Oscar Wilde's author page. A yellow aster by Iota. Oscar Wilde (1854-1900) was an Irish playwright, essayist, critic, novelist, poet, short story writer, editor, classical scholar and bibliophile. He was an influential critic and public figure associated with the Decadent, Symbolist and Aesthetic movements in art and literature. Wilde was a mentor to and defender of many of the writers and artists of his day; he was also a sparring partner to some. For more works by Wilde, see The Complete Works of Oscar Wilde, Introduced by Merlin Holland (Fifth Edition, HarperCollins Publishers, 2003). This LibaryThing catalogue is a tribute to Oscar Wilde and Thomas Wright’s Oscar’s Books: A journey around the library of Oscar Wilde (known in the U.S. as Built of Books: How reading defined the life of Oscar Wilde). I have attempted to list most of the books mentioned in this literary biography; all the credit for the research must go to Thomas Wright and the scholars who came before him. I must stress, however, that any errors or omissions in this online catalogue are mine. This library is best viewed with the Comments field visible, as I'm adding explanatory notes about why Wilde owned certain books, their connection to his personal history, inscriptions within his copies, etc. On 24 April 1895, Wilde’s library, along with all the Wilde family’s possessions, was auctioned off to pay his creditors, in particular the Marquess of Queensbury, who was determined to see Wilde thrown in prison and stripped of all his dignity. During the auction, many of Wilde’s belongings, including manuscripts, were stolen by looters; not all have been located by scholars. At the time, Wilde was awaiting trial. The loss of his books was a terrible blow. Wilde’s collection of books, manuscripts and letters is now scattered across the globe. Some of the items from his library are held by institutions; others are in private hands. Based on the catalogue from the 1895 auction, Wilde owned around 2,000 books. Not all of them were individually listed in the catalogue. Some of the books that Wilde read and owned are alluded to in his letters and other records. - Wilde was fluent in English, French, Latin, Greek, and Italian, and to a lesser extent, German. He generally preferred to read books in their original language. - Wilde was an accomplished scholar of Latin and ancient Greek, and graduated from Oxford University with a first-class degree in Literae Humaniores (i.e., the honours course in classics, philosophy, and ancient history). - Wilde sometimes worked as a book reviewer, and some of the titles in his library may have been ones he was obliged to review, rather than ones he wished to own. - As a successful writer, Wilde received presentation copies from his peers. He also kept copies of his own works in various editions and sometimes presented these in turn to his peers and family. - While he was in prison, Wilde requested many books and these lists were recorded. Wilde requested some titles on behalf of his fellow inmates, knowing that they would be added to the prison library. This means that some titles do not necessarily reflect Wilde’s own tastes. - Both Wilde’s parents published books. Lady (Jane) Speranza Francesca Wilde was fluent in several languages and translated French, Italian and German works, including Sidonia the Sorceress. - After Wilde’s imprisonment, his wife Constance and sons Cyril and Vyvyan took the surname Holland. Vyvyan went on to write Son of Oscar Wilde. Wilde’s grandson is the writer and scholar Merlin Holland, who has written books such as Irish Peacock and Scarlett Marquess: The real trial of Oscar Wilde. - The Picture of Dorian Gray: An Annotated, Uncensored Edition, edited by Nicholas Frankel. Update August 2013: As a consequence of a family tragedy, I've lost most of my personal library. This is an insight into Wilde's predicament that I wouldn't wish on anyone. I hope to return to updating this catalogue if and when life improves and I recover my books, or buy/borrow replacements. People have pointed out some books in the catalogue that were printed after Wilde's death; when my circumstances are better I'll replace these with editions printed during Wilde's lifetime. I find that when you add books to a catalogue, it's not easy to specify the year of publication. The auction list from the sale of Wilde's belongings is also extremely vague; no care was taken in selling off the library of a disgraced man.